Station Cars Network which is located in Norwood, London is offering a wide range of services like the hiring of Minicab and taxis along with providing the best Airport Transfers to and from the terminal. The comprehensive range of transport service is a 24-hours service, which is offered 365 days a year. 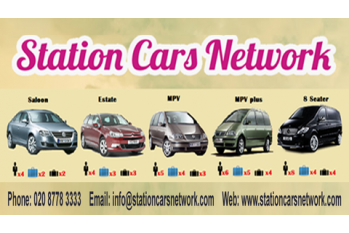 Station Cars Network has been providing these services since 2016, covering a broad area ranging from M25, all the way through its suburbs. Station Cars Network can be reached for a minicab service from all the major Airports of London such as Heathrow, Luton, Gatwick, Stansted and London City Airport. We also have a refined and dedicated Norwood Minicab service for hotels, restaurants, theaters, offices, clubs, hospitals and universities. Station Cars Network is covering the local areas such as: Norwood, West Norwood, South Norwood, Upper Norwood, Norwood Junction, Crystal Palace, Penge, Anerley, Gipsy Hill, Sydenham, Forest hill, Beckenham, Dulwich Village, Selhurst Park, Bromley Common, Lewisham, Herne Hill, Catford Broadway, Thornton Heath, Norbury, Streatham Vale, Tulse Hill, Croydon, Purley, Orpington, Gipsy Hill, Brixton and many more areas in West, East, North & South London & Surrey. Keywords: Norwood Taxi, West Norwood Taxis, South Norwood Cab, Upper Norwood Cabs, Norwood Junction Airport Transfers, Crystal Palace Taxis, Penge Cab, Anerley Cabs, Gipsy Hill Taxi, West Norwood Cabs, South Norwood Taxis, Norwood Cab, Upper Norwood Taxi, Norwood Prepaid Taxi, Norwood Minicab, Penge Taxi, Anerley Taxis, Crystal Palace Cab, Norwood Airport Transfers, Gipsy Hill Cabs, Norwood Junction Taxis, West Norwood Cars, Cheap Norwood Taxi.